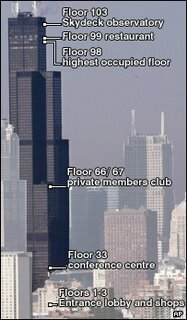 "We are as safe as we have ever been, and as safe as any city can be," Chicago's Mayor Daley today. Five suspects in an alleged plot to bomb the tallest building in the US, Chicago's Sears Tower, and other buildings appeared before a federal judge in Miami today. Another defendant was scheduled to make a court appearance in Atlanta and it was not clear when the seventh suspect would appear in court. Attorney General Alberto Gonzales said "the efforts of 'homegrown terrorists' who reached out to an informant posing as an Al Qaeda leader represent a new twist in the war on terror." Five of the defendants are U.S. citizens, one is a legal permanent resident and one is an illegal alien.